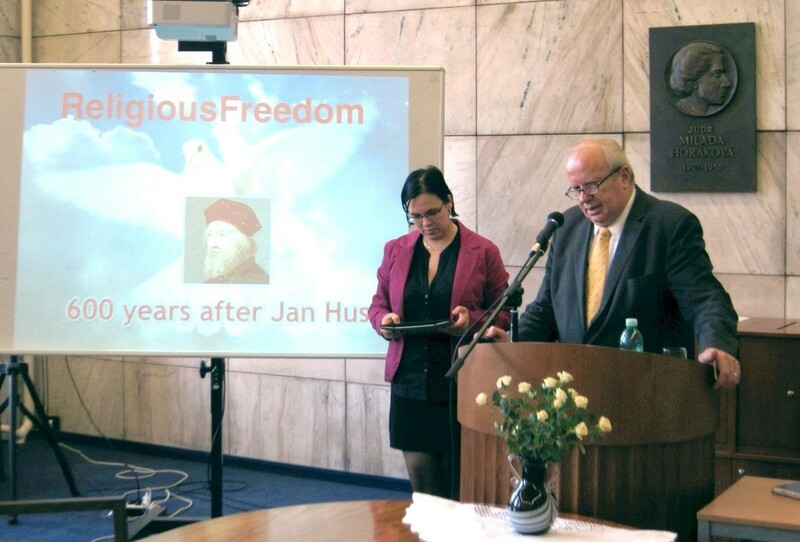 By UPF Czech, Juraj Lajda: On the occasion of 600th anniversary of John Hus burning at the stake, the Czech branch of the Universal Peace Federation in cooperation with the Faculty of Law of Charles University in Prague have organized the International Conference titled “The Importance of Jan Hus on the Way to Freedom of Conscience and the Rights of Religious Minorities”, which took place in the framework of the project The National and Cultural Identity on October 1, 2015. Guests from abroad also appeared in the second panel of the Conference. In the introduction, Dr. Juraj Lajda, Secretary General of UPF in the Czech Republic, reminded that the aim of the conference is to highlight the personality of Jan Hus, his life and work in the context of the liberation of the human conscience and seeking of the religious freedom and its boundaries. Jan Hus, therefore, stands at the beginning of this path. The baton have taken over many next runners on this track, whether it is Martin Luther, Gándhí or Martin Luther King and others. Jan Hus was burned at the stake in 1415. This action sparked an outrage in the Bohemia (Complaint Matters Sheet of the Czech and Moravian nobility from 2nd September 1415) and released the Hussite movement as inadequate response to the then circumstances. It should be stressed that the Hussite revolution has not been planned by Jan Hus and it was not his path of efforts at the Church reformation. Jan Hus wanted in particular to reform the Church which, according to him, as the second pillar of the government alongside of the secular power was in a state of decline and diverged from the truth of Christ’s teachings. In the 1990’s years, Pope John Paul II asked in publicly for forgiveness because of Jan Hus burning. But the fact remains that Jan Hus wasn’t rehabilitated and wasn’t accepted back into the bosom of the Catholic Church. In the first panel, three talks were given by representatives of three Protestant churches: Slovak Evangelical Church of the Augsburg Confession, the Czechoslovak Hussite Church and the Evangelical Church of Czech Brethren. Radim Pačmár, M.A., Slovak and PhD student at the Slovak Evangelical Theological Faculty, stressed the fact that Jan Hus tradition was revered for many centuries in Slovakia, especially in Evangelical circles. The Slovak Lutherans have considered Jan Hus as to be preparer of the Reformation carried out then a hundred years later by Martin Luther. Hus did not create a sophisticated theological system but he had a love of truth and faith. He encouraged people to go back to the springs of faith. No book press printing existed at that time, the ideas couldn’t be disseminated so quickly. According to the historian Bodický, Hus was an exemplar priest. Slovak Protestants have sung Hus’s songs. 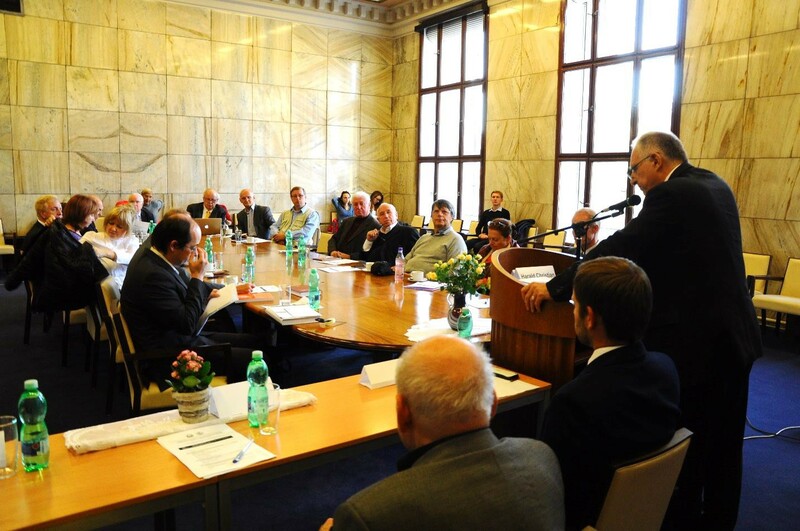 Prof. Zdeněk Kučera, doctor honoris causa, theologian of the Czechoslovak Hussite Church, dealt with the question of conscience freedom in the understanding Hus as a theologian. If we have a religious motivation, we may be willing even to lay down our lives. Martyrdom belongs to religion. Jan Hus did prove his truth to guarantee through his own life. The path paved by Hus was bitter and hard-trodden by many saints and “heretics”. Rev. 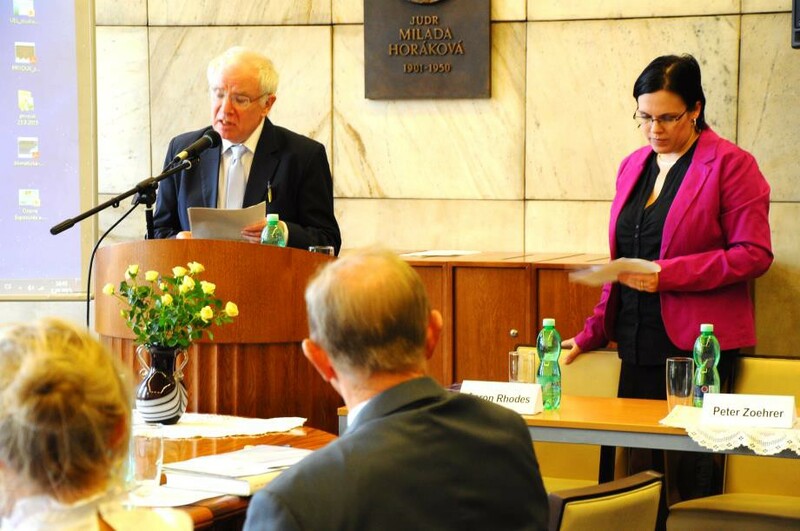 Dr. Josef Hromádka dwelled on inquiry of Hus’s legacy remaining in the present. The truth requires a courage and an open heart. People should follow the truth – the truth should not be manipulated by people. In history, however, the criterion of the good changed so that the measure of all the values and things became the human. Our conscience is not only a product of chemical reactions and processes. Dr. Hromádka mentioned Hus’s appeal to Christ, when he had no another choice, how to defend his truth. The second panel was opened by Kateřina Děkanovská, M.A., PhD. with her speech on the topic of “Freedom of conscience and the Legacy of Hus and Luther”. As the prefatory question she asked, whether the theology is a timeless or time-dependent work. It is difficult to whip out Jan Hus and Martin Luther of their era. Today, freedom of conscience and religious freedom get into an open dispute in many situations because of the secularization and privatization of the European spirituality. For Jan Hus, the freedom of conscience with reference to the freedom of human in Christ was an absolute value. So much as law, political or social customs and establishings contradicted the teachings of Jesus Christ and freedom in Him, Hus demanded their removal and redress of conditions. Unlike Hus, theology of Martin Luther entered into a different time and situation, so it encountered a real political support and didn’t gotten a widely accepted stigma of heresy. The particular German states are, in principle, arranged by his thesis – cuius regio, eius religio. In the second panel of the Conference appeared also guests from abroad. Dr. Aaron Rhodes, President of the FOREF Association, talked about Jan Hus from the perspective of human rights. Human rights are a secular concept, which emerged as a product of the enlightenment. It is popularly said today that human rights are something we have inherited from the various religious traditions. Most of the world’s religions had led the people to understand the value and dignity of human beings, i.e., what needs to be protected by human rights. They did not provide, however, some political or legal mechanism that would put the human rights into reality. In the traditional Islam, no concept of human rights exists. Islamic law ordered the monarch to treat his people fairly and compassionately but it has nothing to do with such an arrangement, when the power of the ruler is legal restricted and the people can require their ruler to respect the human rights and liberties. Similarly, no concept of human rights was applied in the ancient Jewish kingdoms. Jan Hus exhorted the medieval Christianity to return to its commitment to freedom and equality and to the roots of Judeo-Christian tradition. Afterwards, the executive director of FOREF association Peter Zoehrer held his speech and pointed out some specific examples of human rights violations in particular countries. In many countries, even in the schools the students are being taught biased about other religious groups than traditional religions. Among others, he mentioned also Austria, where some organizations supported by the State campaign against so called sects, even if they have no conclusive evidence. Doc. Dr. iur. Harald Christian Scheu, Mag. phil., PhD. opened the third, final panel of the Conference with his contribution on “Legal Status of Religious Minorities”. He stressed the importance of freedom of conscience which dwells in each of us. It is neither religion nor atheism but a kind of conscience dictate in us. But how we can recognize that our conscience is true? The conscience may become a hostage to political correctness. Cardinal Beran alluded to freedom of conscience. The closing contribution was read by Dr. Radim Petráš on “So-called Consent of Kutná Hora in 1485 as the first solution to the legal status of religious minorities in history?”. The minority problem arose during Reformation. Minorities often respond to the specific problems and since the Hussite wars in Bohemia, the situation couldn’t be stabilized. The only exception was brought by reign of George of Poděbrady, when Calixtins (Utraquists) and Catholics lived in peace. In 1471, the Utraquists promoted Vladislav for Czech king, even though he was a Catholic. The Consent of Kutná Hora featured a sample of the rules, how to deal with religious conflicts. Well-founded contributions were heard by more than 30 people present listeners. A lively debate has shown that the given topic has aroused a considerable interest among the audience.